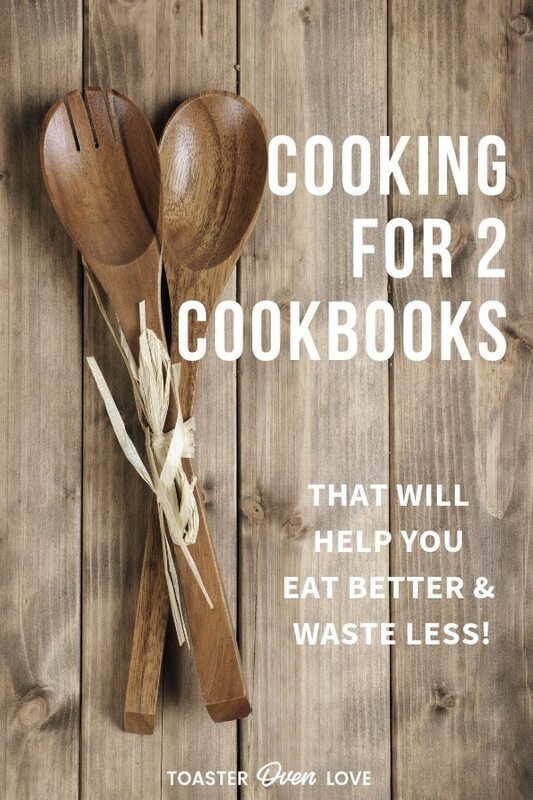 Cooking For Two Cookbooks To Help You Eat Better & Waste Less! Are you new to cooking for two after years of feeding a big family? Starting out on your own for the first time? Or are you just looking for a little mealtime inspiration? These Cooking For Two Cookbooks will help you get dinner on the table without leaving you stuck eating a bunch of leftovers all week. Today I’m sharing my favorite Cooking For Two cookbook plus two others I think you might enjoy. You’ll find a little about the recipes and stuff you should know before purchasing. Since we can’t all be looking for the same thing in a cookbook, I’ve included a section for who will get the most out of each book. We’ve also put together a list of Cooking For One Cookbooks for those days when mealtime is just for you! A quick heads up: this post contains affiliate links. As an Amazon Associate, we earn a commission from qualifying purchases. The Complete Cooking For Two Cookbook by America’s Test Kitchen is one of my all-time favorite cookbooks. It’s written specifically for small households and includes shopping tips along with ideas for using up ingredients. Chapters & Recipes: There are 17 chapters and 650 recipes designed to feed two people. For omnivores, there are chapters dedicated to chicken, beef, fish, and grilling. There’s a nice variety of recipes in the vegetarian mains chapter too. But nothing too funky. Most of the recipes call for common meatless proteins like beans, quinoa, tofu, and tempeh. In addition to main dishes for two, there are chapters for soups, salads, burgers and sandwiches, slow-cooker, vegetable sides, grains, and breakfast. If you enjoy baking there are chapters with quick breads, pies and tarts, and cookies and cakes. It truly is a complete collection of recipes for two. Things You Should Know: Some of the recipes do seem overly complicated and dirty more than a few dishes. Also, while the majority of the recipes use pantry staples some do call for specialty ingredients. Things like miso paste, sesame oil, liquid smoke, and saffron. Extras: Sprinkled throughout the book you’ll find lots of how-to photos for certain instructions and cooking methods. There are also notes explaining the why’s of each recipe and information about different ingredients. The ‘Basics Of Cooking For Two’ area has everything you need to set up your kitchen. Including tips for purchasing and storing items, using up ingredients, and the best kitchen equipment for small households. Couples and singles looking for a wide variety of recipe ideas that won’t leave them with lots of leftovers. Empty nesters that want to make smaller portions of their family-favorite recipes. Anyone learning to cook for themselves for the first time. P.S. America’s Test Kitchen published an All-Time Best Dinners for Two Cookbook. Looking through the reviews it appears all the recipes are from The Complete Cooking For Two Cookbook. Given that, we’d recommend the full cooking for two cookbook, as it’s a better value for your dollars. One Pan, Two Plates: Vegetarian Suppers by Carla Snyder has over 70 one pan vegetarian dinner recipes designed to make just two servings. The recipes are meant to be quick, easy, and with very little cleanup, so you can actually cook them on a weeknight! Chapters & Recipes: A wide variety of meatless dinner recipes can be found throughout the book’s 6 chapters. There’s warming soups, hearty grains and beans, super veggie-focused meals, unique pastas, easy egg dishes, exciting pizzas and savory tarts. The recipes use lots of fresh vegetables and healthy proteins like eggs, beans, grains and a few with tofu. But don’t worry, there are plenty of yummy recipes for cheesy comfort food too. Things You Should Know: The recipe format is a little tricky. With the ingredients side-by-side above the recipe directions (which are also side-by-side). In my experience, it’s easy to skip an ingredient or recipe step with this style. Also, a lot of the recipes take 40 minutes or more. Depending on your schedule these might not qualify as weeknight cooking for you. Extras: There are so many special touches in this cookbook. One of my favorites is the conversational headnotes that make you feel like you’re cooking with a friend. If you’ve got a healthy appetite you’ll enjoy the ‘Extra hungry?’ section on the recipes. Each one has tips for making the meal more filling. It’s nice for those days when one of you wants something a little heartier. Carla’s included a few pages of great weeknight cooking tips at the beginning of the book. But what you’ll like even more is the ‘It’s that easy’ area on each recipe. They’ve got info about unique ingredients, cooking tips, and alternative serving ideas. Your favorite vegetarian couple or single friends that loves to cook. Anyone cooking for one or two that’s interested in eating more meatless meals. P.S. If you’re digging this one-pan cooking for two style make sure to check out Carla’s other cookbook One Pan, Two Plates: More Than 70 Complete Weeknight Meals for Two. It’s mostly meat and chicken recipes but there are some vegetarian recipes too. Gluten-Free Cooking For Two by Carl Fenster is (as the name implies) a cookbook focused on gluten-free recipes designed to feed two people. Chapters & Recipes: The recipes are mostly for familiar comfort foods but do include some adventurous dishes too. There are chapters for breakfasts and brunches, soups and sandwiches, main dishes (40 recipes! ), sides, breads, and desserts (including 7 small-batch cookie recipes). Your family member or friend that’s following a gluten-free lifestyle and cooking for one or two people. Anyone interested in learning to cook gluten-free without making large amounts of food. You can read our full Gluten-Free Cooking For Two Cookbook Review here. Make sure to check out the tested recipes! What is your favorite Cooking For Two cookbook? What would you add to this list? Please share your suggestions in the comments! I have 200 meals for Two by Louise Blair, which I use a lot. Short, simple recipes with pictures for each one. But the best recipes are in the collection of Cooking for Two by America’s Test Kitchen. I have bought several of their soft cover books ( more magazine) at Costco, the 2016 issue on Baking for Two, and both 2017 and 2018 on Dinners. They now have compiled all their soft cover annual editions and more into one large hardcover book.